From goodreads: Maggie Young had the market on normal. Normal friends, normal parents, normal grades…normal life. I had a really hard time rating this book and not because I didn’t love it but because the beginning of the story seemed a bit slow. I went back and forth between the 4 and 5 star rating. I’m all for laying the foundation for a strong and powerful slow-building story but some of it just seemed to drag. I think the insta-love also had something to do with my initial lack of connection to the characters. But make no mistake…I absolutely loved this book. This is how you tell a heartbreaking story about the fragility of the mind. Not many authors can tackle this dark subject matter and get it right but A. Meredith Walters nailed it. Find You in the Dark touched me deeply and I’m not sure that I have fully recovered from reading this book because I still feel a bit broken inside. It is when we are overwhelmed by our mental anguish that we hurt the ones we love and often time, hurt ourselves more. Sometimes we seek in others what we are unable to give ourselves, love and stability. It’s when we force happiness and a love that is meant to be wonderful by creating a façade; we only plunge deeper into the depths of despondency. This is that story. Enter Maggie. Maggie is a sarcastic and witty high school senior who is bored to pieces with her life until she meets Clay. Their worlds literally collide together and nothing will ever be the same again. The love that Clay and Maggie have for each other is intense and unyielding. The honeymoon is brief and secrets are slowly revealed and that’s when we meet the real Clay. One might think that Clay’s love for Maggie is obsessive or even oppressive. You might even think his love is selfish but as the story unfolds you realize that’s not it all. His love is pure and his redeeming qualities are there but his love is filled with desperation. I felt the desperate love that Maggie and Clay had for each other. Maggie’s love was loyal and profound and she was faced with the challenge in helping him. She was desperate to protect him at all costs regardless if it meant she had to alienate herself at times. Clay desperately tried to do the right thing by Maggie but struggled daily with the demons that were his constant companions. This is a well written story about the complexities of falling in love with someone who cannot be cured by love alone. 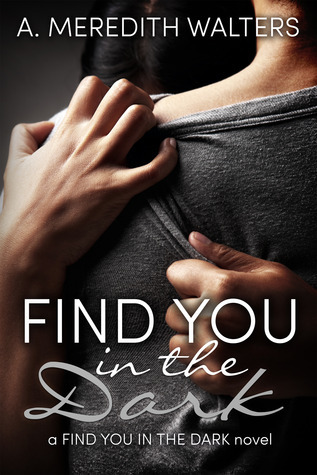 Find You in the Dark will make you uncomfortable and perhaps even scare you but it’s told with dignity and respect. While I wasn’t invested in Maggie and Clay immediately I have not been able to stop thinking about them or their journey. My final two cents: This is an amazing story despite the bumpy start. I cannot wait to read book 2, Light in the Shadows and I only hope they get their happily ever after. Just bought this book on sale. Would love to find time this century to read it Sounds good! This book moved me so much! I loved it!!! Worth every penny!